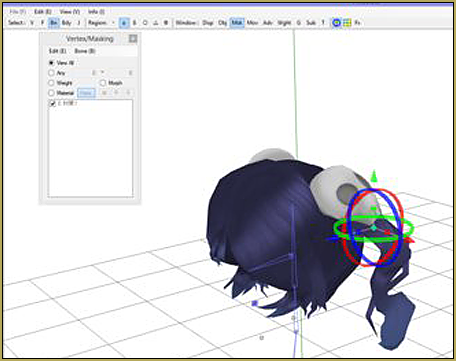 How do I add hair physics to my model’s hair? Should my model’s hair have bones? 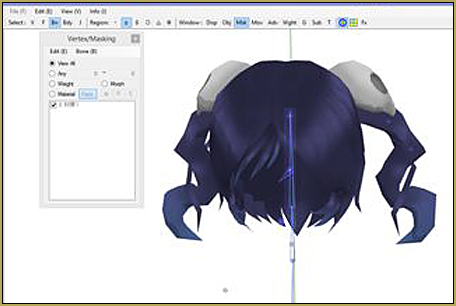 How can I use PMXE to add hair physics to my model’s hair? 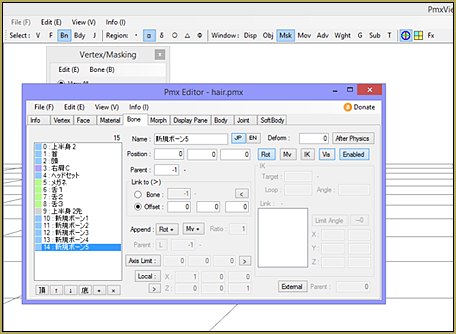 Add Hair Physics in PMX Editor! 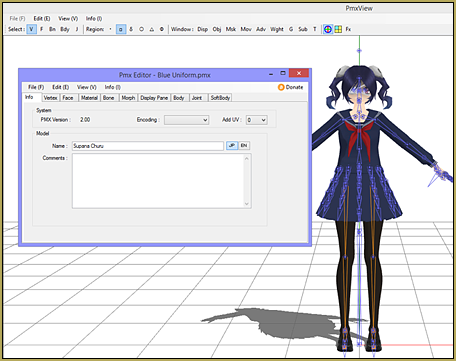 Hi y’all… Today I’m going to show you how to create physics in MMD. 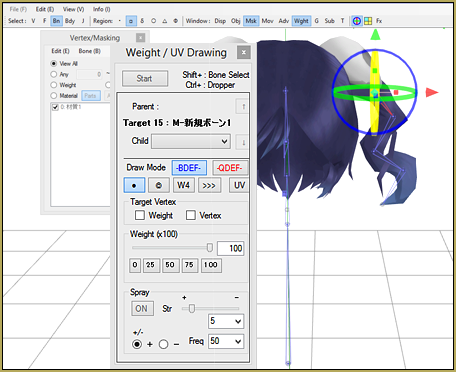 For an example, I want to add hair physics to Virtually3D‘s Yandere Simulator model Supana Churu, because I was asked to add physics into her models. 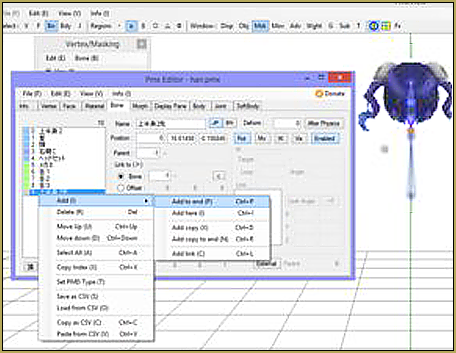 So, of course, the first thing you want to do is open up PMXEditor and open up the model without physics. 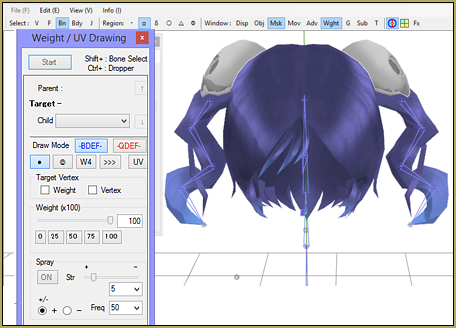 … how am I supposed to add hair physics to her hair if this is a full model? That’s easy, just take away the body! Remove everything but the head bone, neck bone, upper body bone and the hair you want. Yes, even the joints and physics. 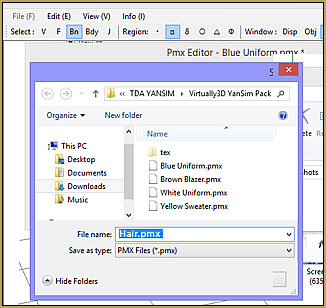 Now that you have all of this, save it as something like “hair.pmx”. 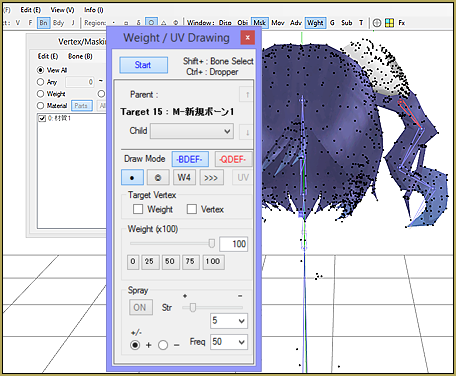 Now for the literal hardest part of this whole tutorial: creating and adding bones. First, add the bones. just create a string of bones by using this short tutorial below. 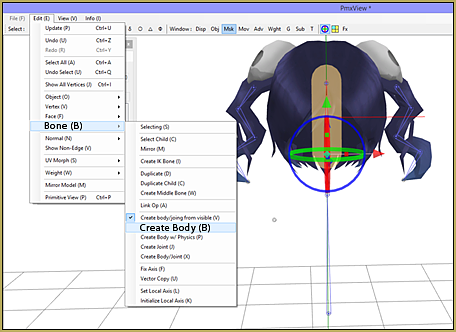 Add a bone needed for the hair by Right Click (in the white space)>Add>Add To End. Move the bones to the position you need them to be. Move that one where it needs to be. Click on the bone above it, then select the option that says Bone. On the side there are numbered bones that go 1, 2, 3 and down… To make the top bone attached to the lower one, click on the lower one and in the box next to bone, type in that number. Ex: My bone was 10 and it needed to be attached to 11, so I typed in 11 on the bone option. Now just keep repeating this process until they’re all where you want them in one ponytail. Don’t forget to make the end bone invisible! Now weigh them down with this short tutorial! Then keep going all the way down. Now here’s the easiest part. 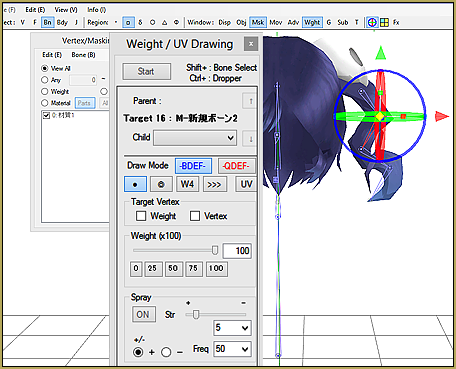 Select the head bone and click Edit>Bone>Create Body>Yes. This creates a physic on the head. Now select the ponytail bones and click Edit>Bone>Create Body w/ Physics. 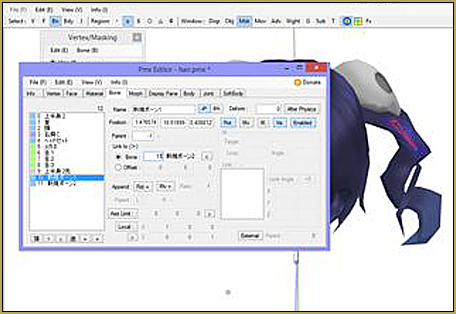 Then WITH THE BONES STILL SELECTED go to Edit>Bone>Create Joint. Now you’re almost done! Look at this very short video to finish what you started! … be sure to leave a comment to ask a question! The vid doesn’t explain anything, but it just shows what he/she is doing. I can’t get hair physics to work. 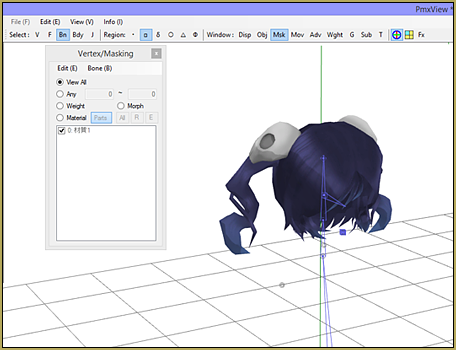 Even if they work, the model just crashes MMD whenever I load it. 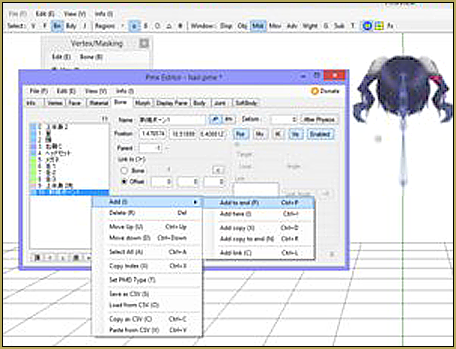 For starters, look into PMXE’s Joint tab. Check if every joint has its “Body A” and “Body B” fields filled. If that’s not enough, try to run “File->PMX Info” command, Google Translate its output, and see what errors your model may have. See the tutorial for more details. 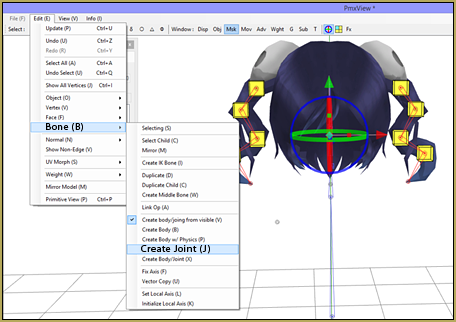 The most common cause of MMD crashes, especially after editing physics, is orphaned joints. 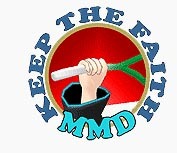 Go through all of your joints and make sure that each is connected fully, to two rigid bodies. 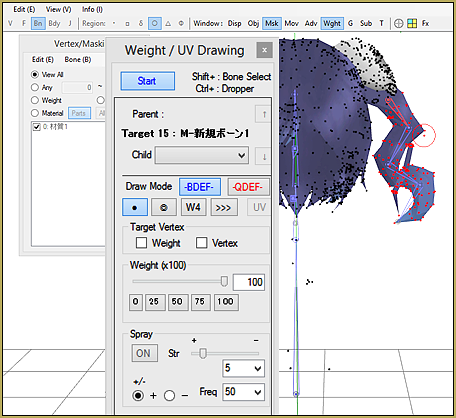 You probably need to make sure that the first join of the root connects to a bone-type rigid body for its first body. I followed this to the best of my abilities with hair that is a single long ponytail on the side and the whole ponytail just falls to the ground, stretched from the head and all. What do I do. Also, I got really confused in the video because it was all in japanese vs my parts being in english + i need to know exactly what doing what’s in the video does. Thanks! Model name: | … △ The model name is empty. Comment: (*******) | … △ The comment is empty. Unregistered bones: 6 | … The bones below △ are not registered in the display frame. Rigid body A reference illegal: 1 | … × Bad! The following Joint has incorrect rigid body A setting. Rigid body B reference illegal: 1 | … × Bad! Joint below Rigid body B setting incorrect. I used this other tutorial (https://www.youtube.com/watch?v=V5Pt8ArK-FY&t=510s) which made more sense to me, but basically gave me the same outcome. Someone in the comments mentioned static vs dynamic physics, but i don’t know how to enable that. Apparently the joint #5 does not join anything or is otherwise faulty. How would I go about fixing that? In Joints tab, find the record #5. “Body A” and “Body B” refer to a pair of rigid bodies (aka “physics”) that the joint is supposed to connect. Without seeing your model, I can’t guess which ones they should be, though. If you use a newer PMXE, you may try to call for TransformView window (F9), make sure rigid bodies are visible (“Bdy” button the upper left toolbar), and press the “Mode: ►” button. Supposedly you will see what bodyparts go scatter and what needs to be connected. 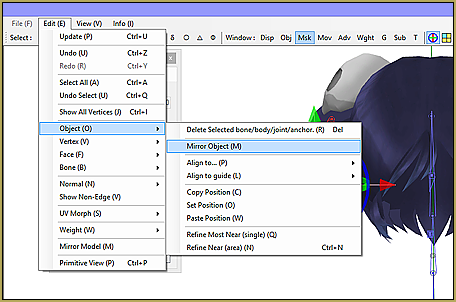 If you only know how to use PMDE, try to delete that joint altogether, save under a different name, and load the model into MMD for the similar result. Hopefully it won’t crash without that offending joint and you will get your answer. I could not figure out how to remove your body. That’s why I’m so glad you helped me. I’d be glad to help you… What are you talking about?